The Hotshot chassis is a milestone for Tamiya. 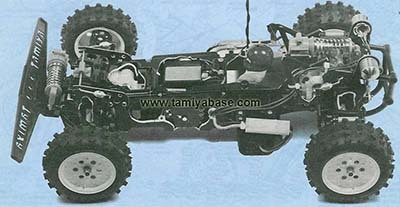 The first 4wd chassis and the forefather of many similar chassies to come. The front and rear suspension both have single shocks/springs and double wishbone system. The rear damper connetce to the a-arms through a relatively complex system. The radio box is enclosed making it quite hard to manitain the enclosed radio gear. The Hotshot chassis evoveld during production, but one typically talk about the Mk.1 and Mk.2 of the vintage ones. The most prominent difference is the Mk.1's front bumper with hols in it and a much steaper angle. The HotShot was re-released in 2007 where the chassis has received a lot of smaller changes compared to the vintage ones.